Christine Kehoe has been a name to conjure with in San Diego activism, journalism and politics for over three decades now. And soon Christine Kehoe may be the name of a school. On Wednesday, October 8, 7 p.m. at Florence Elementary School, 3914 First Avenue between University and Robinson on the cusp of Hillcrest and Mission Hills, the San Diego Unified School District will hold a community meeting to discuss renaming the school after San Diego’s first openly Queer elected official. I first heard of Christine Kehoe in 1982 when the San Diego Public Library started distributing a little newspaper she was editing called The Longest Revolution, about the feminist movement. Her articles in that scraggly little paper were always fascinating and inspiring reading. But I didn’t get to know and work with her regularly until 1984, by which time she’d come out as a Lesbian and taken a job as editor of the Gayzette. The Gayzette was a marvelously named publication that had been launched two years earlier by renegade staff members from San Diego’s pioneering Queer paper, Update, but I didn’t know that then. What I did know was that the Gayzette started surfacing at the Ken Cinema in Kensington and it was a beacon light to quite a few San Diegans struggling with their sexual orientation … including me. Certainly it was the first outlet for the Queer press in San Diego I can remember reading, and in 1984, a year after my own coming-out, I started writing for it after Christine Kehoe graciously interviewed me, decided she liked my writing and brought me on as a contributor. There wasn’t much money in it — there never is in community journalism — but there was enough exposure, challenge and sheer fun to make it worth doing for the next two years. By 1993 I was writing for San Diego’s Gay & Lesbian Times and Christine Kehoe was putting together a campaign to run for the San Diego City Council. Two other openly Queer candidates, Al Best in 1979 and Neil Good in 1987, had tried Council races before — and neither had worked their way out of the district primaries. Kehoe’s path to the Council had been paved by two important developments: first, San Diego voters finally approved district elections — which meant that Council candidates only had to get the support of voters in their communities and didn’t have to run in citywide general-election campaigns. Second, thanks to a lot of volunteer work on the part of members of the San Diego Democratic Club (now the San Diego Democrats for Equality) and others, the neighborhoods containing the greatest proportions of San Diego’s Queer population, Hillcrest and North Park, had been combined into a single City Council district. At the time, that district was represented by Queer-friendly straight Councilmember John Hartley, but his decision not to seek re-election in 1993 left the field open for a Queer challenger — and Kehoe, who’d had on-the-job training as a staffer in Hartley’s office, decided to make the run. She wasn’t without opposition, even within the Queer community. Evonne Schulze, a long-time community activist and a straight woman with a Queer-friendly reputation, had sought a City Council seat unsuccessfully three times from the College-area District 7. She decided to carpetbag into the new District 3 and capitalize on her long-standing relationships with Queer leaders like Nicole Murray-Ramirez to take on Kehoe. But there were enough Queer voters in District 3 who had had enough of being represented by straight Councilmembers, no matter how sympathetic, and wanted instead to have one of our own in office. The Gay & Lesbian Times and its publisher, the late Michael Portantino, practically made Kehoe’s election a staff project. So did the San Diego Democratic Club and most of the organized activists in the Queer community. By the time the election was over, Christine Kehoe had become the new District 3 City Councilmember, the glass ceiling had been broken and the way had been paved for otherwise qualified Queer candidates to run for, and win, elective office in San Diego. Since Kehoe’s election the District 3 seat has always been held by an openly Queer Councilmember: she was succeeded by her friend and former aide Toni Atkins, and then by current City Council President Todd Gloria. Indeed, a measure of Kehoe’s triumph has been that being Queer is no longer a political issue in San Diego. In the 2012 Mayoral election there were two openly Queer candidates out of the four major contenders, and both of them were Republicans — City Councilmember Carl DeMaio (now running for Congress against Queer-friendly straight incumbent Scott Peters) and San Diego County District Attorney Bonnie Dumanis. 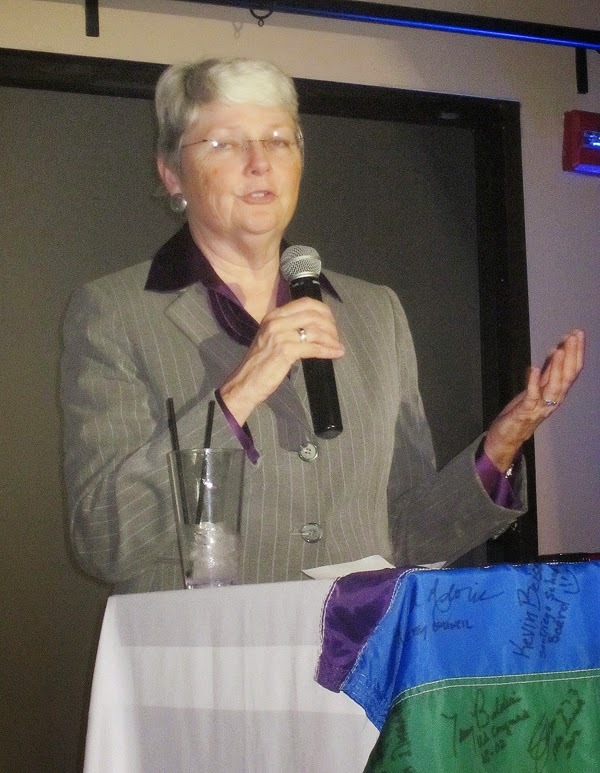 After they were forced off the Council by term limits, both Kehoe and Atkins ran for the state legislature, and while Kehoe retired from public life after being termed out of her State Senate seat in 2012, Atkins was recently chosen Speaker of the California State Assembly — the second open Queer, and the first open Lesbian, to hold that job.